Although the fan scallop is a feature commonly found on collectible American cut glass, it has not received much attention. Nevertheless, it is a subject worth looking at in some detail, not least because it can sometimes provide clues that can be used to date an object, at least approximately. This particular example shows small flat areas at the ribs’ ends; some cutting shops would have “rounded” these areas. The date of this catalog-entry, 1893, is near the end of the period when this style of fan scallop was used. It had begun to be replaced by an entirely different style as early as the late 1880s. In this later, or regular, fan-scallop style the fan’s ribs donot form the scallop’s serrations; they are independent of them. Each rib is usually contained within a single serration, as shown by the illustration above, on the right, which has been taken from the same Bergen catalog as the preceeding example. The pattern is called Columbia (no. 761 dessert plates in this pattern are shown in Swan 1986, p. 212). This design, incidentally, owes a great deal to Hawkes’ Chrysanthemum. The example shown here has an uncut area just below the bowl’s rim. On some examples of this style the uncut areas are wider, but on others the area is reduced to practically zero, with the tip of each miter cut enclosed within a serration, making the repair of any damaged serration difficult if not impossible. RULE: In the later, or regular, style of fan scallop the total number of serrations (rounded “teeth” plus the sharp “teeth” that form the “shoulders” of the two adjacent notches) will always equal the number of ribs contained in the fan. The number of ribs is almost always an odd number; hence, the total number of serrations will also be an odd number (note 2). By c1895 most cutting shops had adopted the later style of fan scallop. Possibly it was easier to cut than the earlier style. A good example of this change in style is recorded in the composite catalog that has been assembled for C. Dorflinger & Sons (note 3). All of the fan scallops in the first section of this catalog — now dated c1891 instead of c1886 — show the earlier style, with two exceptions: Those items now believed to have been cut by T. G. Hawkes & Company. (They all have the later style of fan scallop, in addition to Hawkes’ U-notch). The other exception is discussed in note 3. The second section of this composite catalog — which has been dated c1895 — has a mixture of the earlier and later styles of fan scallop, but by this date the later style clearly had gained the upper hand. T. G. Hawkes & Company used a great variety of rims during its 83 years of operation. The firm seems to have settled on the later style of fan scallop well before 1889, when the Brazilian pattern was the first of the patented patterns to use it. The later style also shows up on examples of the Russian pattern (c1885) that have fan-scalloped (star-scalloped in this case) rims. (Star scallops used with the Russian pattern are discussed later in this file.) It is likely that the later style was also used on the non-patented Cobweb pattern — which was in production by 1885 — but photographic evidence is not available. The writer has been unable to find any examples of Hawkes cut glass with fan-scalloped rims cut in the earlier style. 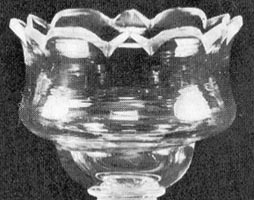 The Libbey Glass Company used the earlier fan-scallop style on articles cut in its Florence pattern (1889), and probably on articles cut in its Victoria pattern (1887) as well, but then the company changed to the later style. (Both of these patterns also used, briefly, a style with smooth fan scallops that is discussed below.) At T. B. Clark & Company, the firm’s “Sea Shells” pattern of 1892 signalled the change. The change seems to have occurred at the Mt. Washington Glass Company about 1893 with the patented Hortensia pattern. The 1893 catalog issued by L. Straus & Sons (note 4) shows that all of this firm’s fan-scalloped rims were still being cut in the earlier style except for one of the less expensive patterns, Capri, which was patented that year. During the following year, one of four newly-patented patterns is known to have been produced with fan-scalloped rims in the earlier style (Columbus) and one in the later style (Majestic). It is possible that some of the catalog patterns with earlier-styled rims may have been cut at a later date with fan-scalloped rims in the later style, but this is unlikely. At this time companies were anxious to introduce entirely new patterns on a regular basis, rather than recycle old ones. Eighteen ninety-four would seem to be the year when the change-over occurred at L. Straus & Sons. Finally, mention is made of the situation at a seventh cutting shop — J. Hoare & Company. A skimpy early catalog that is contained within a composite catalog provides examples of the earlier style at a time when both styles — together with a convex pillar style — were in use, c1890 (note 5; also see Sinclaire and Spillman 1997, pp. 34-40). A J. Hoare catalog of 1896(note 6) shows only a couple items cut in the earlier style at this late date; they are both cut in the Champion pattern. Fan-scalloped rims on all of the other patterns are cut in the later style. 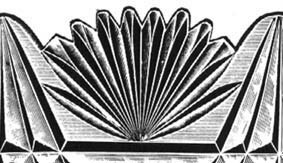 It is reasonable to conclude that the earlier style of fan-scalloped rim was in general use until c1892; thereafter it “lingered” briefly only to be almost entirely replaced, about 1895, with the later style of fan-scalloped rim which had been in use (at least by Hawkes) by c1885. The years c1885 to c1895, therefore, show a mixture of the two styles, with the frequency of the earlier style decreasing and the frequency of the later style increasing during the period, especially after c1890. The third type of fan scallop has no serrations at all and so is logically called the smooth fan-scallop style. Like the earlier style, it was known in Britain and Ireland as early as the 1820s. The smooth fan-scalloped style seems to have been used during the American Brilliant Period mainly as a transitional style in the late 1880s, but it was also used, from time-to-time, in later years. The reader is reminded that the Russian pattern consists of six intersecting sets of parallel miter cuts. The fan (i.e., star) scallop has five radiating miter cuts above a horizontal miter cut that represents the sixth set of parallel miter cuts. In viewing fan scallops cut in the Russian pattern, the eye can be taxed to a considerable extent. When this occurs it is recommended that the viewer re-orient himself by relating the radiating miter cuts to the horizontal, or “basal,” cut. The image on on the left is an excerpt from the composite C. Dorflinger & Sons catalog, previously mentioned. The five miter cuts clearly form the scallop’s four serrations; therefore, the fan scallop is cut in the earlier style. The image on the right is taken from one of the salesmen’s photo-cards used by Hawkes during the 1880s (Spillman 1996, p. 189). Again, there are five miter cuts. But here the middle three are each contained within a serration, while the outer two are related the “shoulders” of the rim’s notches (in this case U-notches). More importantly, the rim’s serrations are independently formed, relative to the radiating miter cuts. Thus, this rim is cut in the later style of fan scallop. This discussion also applies to the Persian pattern. As an aside it is noted that the upper halves of the bordering fans (stars), that are present on the Russian and Persian patterns, can have more than five miter cuts (rays) on articles with straight rims — such as stemware, finger bowls, and bells. An example in the Persian image file shows stemware whose bordering fans have eleven ribs. The appearance of the plate on the left is a bit odd because we are used to seeing serrations of equal size. The plate shows the earlier style of rim scallop, where the rim is formed by five radiating miter cuts. Unequal spacing of the three innermost cuts has resulted in a “rabbit ears” effect. This could have been avoided by not cutting the middle serration into two parts. The rim would then show three serrations of equal size, approximately. This apparently is exactly what was done on an ice cream plate made by Dorflinger for the Harrison White House in 1891. The photograph provided in Spillman’s account (1989, p. 103) is less than ideal, but it clearly shows three serrations of equal size and — with much less clarity — middle serrations that are lightly scored rather than cut through. There is no doubt that Dorflinger made this plate, but it is unexpected to find a rim with three serrations when all of the Russian examples in the composite catalog of about this date have the four smooth “teeth” that are associated with the earlier style of rim scallop. The plate of the right also appears to represent the earlier style of rim scallop. However, note that there are three serrations, not four as required “by definition.” Each of these serrations should contain a miter cut. They are there, but they appear to have missed their marks. In fact the dark marks on the central serrations represent as many as three of these miter cuts, bunched together. Undoubtedly their positions have been optically distorted to some extent. In any case, close-up examination of the original photograph proves that the rim has been cut independently of the radiating miter cuts and is, therefore, cut in the later style. Each of these plates can be viewed in its entirety. They are of high quality and contain points of similarity, not least of which are the multi-pointed stars between the points of the central hobstar, a feature rarely seen. These stars did not reproduce in the photo of the plate on the right. The plate on the left was purposely under-exposed in order to show this motif. Both plates would appear to date from the 1880s, but their makers are thus far unknown. An undamaged set of six plates represented by the plate on the left sold for $425 in 1984. It is also interesting to examine the most famous item that has been cut in the Russian pattern — the large display plate made by T. G. Hawkes & Company about 1906 (Charleston 1990, p. 202). At first glance this masterpiece appears to be a throw-back to the earlier style of fan scallop. Because Hawkes does not appear to have ever used this style, the plate might be considered unique. The four serrations are there, as required, but have they really been formed by the five radiating miter cuts? This writer believes that they have not. Note the tapering rays of the stars, and the fact that the number of serrations that make up each scallop is an odd number while the number of rays is an even number. This dictates the placement of the stars’ rays. Someone will have to examine the plate’s reverse (cut) side in order to provide the correct answer to this question. 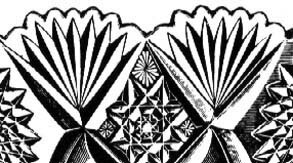 For a degree of completeness, this section concludes with the observation that items cut in the Russian pattern can also have rims cut in styles other than fan scallops. One style that was popular with several manufacturers — including Hawkes and Dorflinger — can be called “scalloped and corenred,” as it was originally described in the second quarter of the eighteenth century in England (Elville 1967, p. 21). This scalloped-and-cornered style can also be found, with variations, on American cut glass of the middle period. 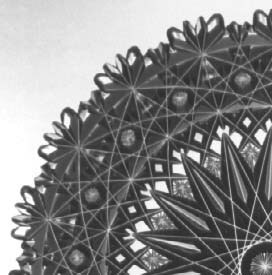 Another style that was used with the Russian/Persian patterns results in a rim that is cut without regard to the pattern; the rim describes a curve that can be either simple or complex. Because it was possible to examine only a small sample of American cut glass in the preparation of this file, the writer welcomes correspondence with dealers and collectors whose experiences can amplify and improve this discussion of The Fan Scallop. 1. THE J. D. BERGEN CO., MANUFACTURERS OF RICH CUT GLASSWARE. Published by the American Cut Glass Association, 1999 (viii + 80 pp). 2. 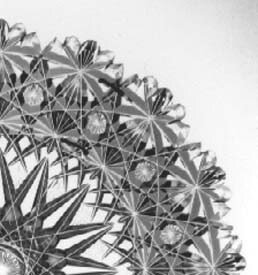 Hawkes broke this rule with his patent-application drawing of the Chrysanthemum pattern. As a result there are articles cut in this pattern where the number of serrations is even and the number of fan-ribs is odd. One example is the well-known display plate that is pictured in Sinclaire and Spillman (1997, p. 54). Within each scallop the fan-ribs change their positions relative to the scallop’s serrations, a discordance. But by the time the ice cream tray shown in the RARITIES book was made, however, conformity had been established, with 5 + 2 serrations and fans with 7 ribs (Wiener and Lipkowitz 1975, p. 105). 3. C. DORFLINGER & SONS, FINE CUT GLASS. Published by the American Cut Glass Association in co-operation with the Dorflinger Glass Museum and the Rakow Research Library of the Corning Museum of Glass, 1997 (xliii + 150 pp). The second exception concerns the Belmont and Dresden patterns which are included in the composite catalog’s first section. They were both introduced in 1891 according to an article in the 4 Mar 1891 issue of Jewelers’ Circular Weekly, p. 17 (reference kindly supplied by Craig Carlson, 9 May 00). Articles cut in these patterns appear only on “negative” plates in the catalog’s first section, suggesting that they were taken from the third of the “three similar but not identical catalogs” that make up this section. The Belmont pattern is shown only with the later style of fan scallop. Examples of the Dresden pattern have both styles. Incidentally, both patterns also appear in the c1895 catalog. Here, again, the Belmont item (there is only one) has the later style, while the Dresden examples show both styles. The date of the first section of the composite catalog has already been changed from c1886 to c1889 (see note 1 in Hawkes and his U-notch); it is now necessary to advance the date to c1891. None of the Belmont and Dresden examples that show the earlier style of fan scallop have the U-notch. This is not surprising because neither pattern is cited in the list of patterns that Hawkes cut for Dorflinger “between 1887 and 1892” (Spillman 1996, p. 92). 4. L. STRAUS & SONS, RICHEST CUT GLASSWARE (1893). Published by the American Cut Glass Association in co-operation with the Smithsonian Institution Libraries, 1987 (37 pp). 5. J. HOARE AND CO., CUT GLASS, CORNING, N. Y. Published by the American Cut Glass Association in co-operation with the Corning Museum of Glass, n.d. (144 pp). 6. J. HOARE & CO., RICH-CUT GLASS WARE. Published by the American Cut Glass Association in co-operation with the Rakow Research Library of the Corning Museum of Glass, 1997 (xviii + 162 pp). The 1896 catalog is found on pp. 1-109.